E-Verify is an Internet-based system operated by the Department of Homeland Security (DHS) in partnership with the Social Security Administration (SSA) that allows participating employers to electronically verify the employment eligibility of their newly hired employees. E-Verify works by allowing participating employers to electronically compare employee information taken from the I-9 Form against more than 455 million records in SSA's database and more than 80 million records in DHS' immigration databases. Results are returned within seconds. If the information matches, that employee is eligible to work in the United States. If there's a mismatch, E-Verify will alert the employer and the employee will be allowed to work while he or she resolves the problem1. Does E-Verify® Replace Form I-9? No. E-Verify does not replace the legal requirement to complete and retain Form I-9, the Employment Eligibility Verification. E-Verify confirms the employment authorization of new hires based on the information provided on the Form I-9. Form I-9s must be retained and stored in either paper, electronic, or microfilm/microfiche format for auditing purposes. E-Verify is mandatory for all federal contractors and subcontractors. Some state and city governments have E-Verify mandates for government agencies and/or contractors. Visit http://www.trackercorp.com/everify-legislation-map.php for an up-to-date map of all active and proposed E-Verify legislation at the city, county, state, and federal level. 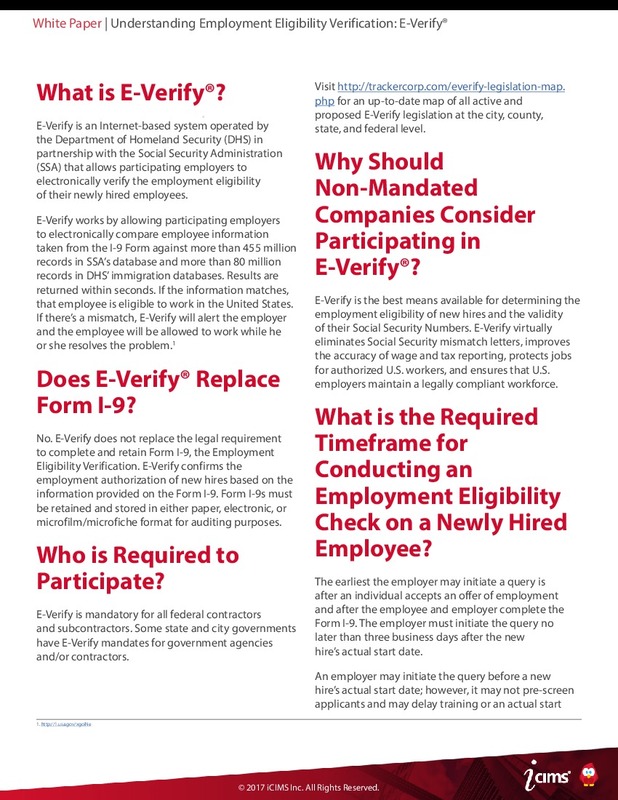 Why Should Non-Mandated Companies Consider Participating in E-Verify®? E-Verify is the best means available for determining the employment eligibility of new hires and the validity of their Social Security Numbers. E-Verify virtually eliminates Social Security mismatch letters, improves the accuracy of wage and tax reporting, protects jobs for authorized U.S. workers, and ensures that U.S. employers maintain a legally compliant workforce. What is the Required Timeframe for Conducting an Employment Eligibility Check on a Newly Hired Employee? The earliest the employer may initiate a query is after an individual accepts an offer of employment and after the employee and employer complete the Form I-9. The employer must initiate the query no later than three business days after the new hire's actual start date. An employer may initiate the query before a new hire's actual start date; however, it may not pre-screen applicants and may not delay training or an actual start date based upon a tentative non-confirmation or a delay in the receipt of a confirmation of employment authorization. 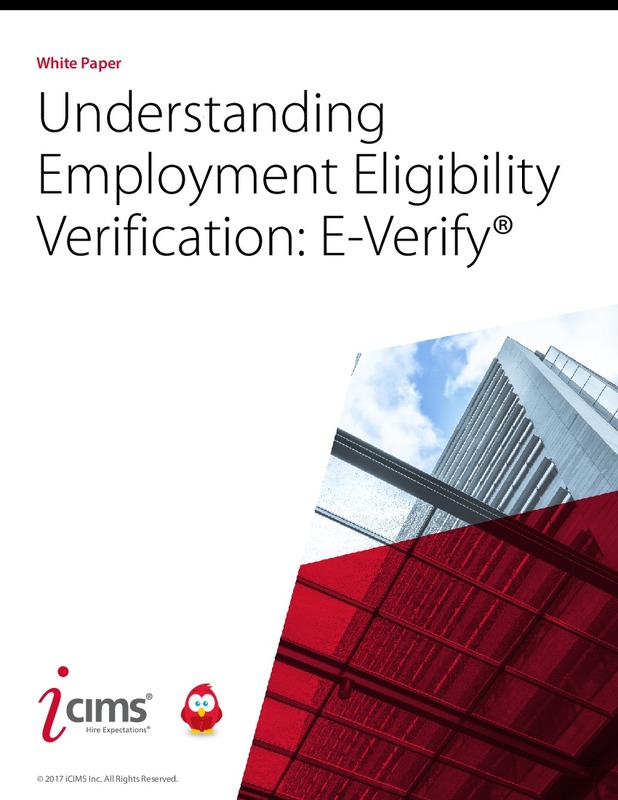 An employee should not face any adverse employment consequences based upon an employer's use of E-Verify unless a query results in a final non-confirmation. In addition, an employer cannot use an employment authorization response to speed up an employee's start date. 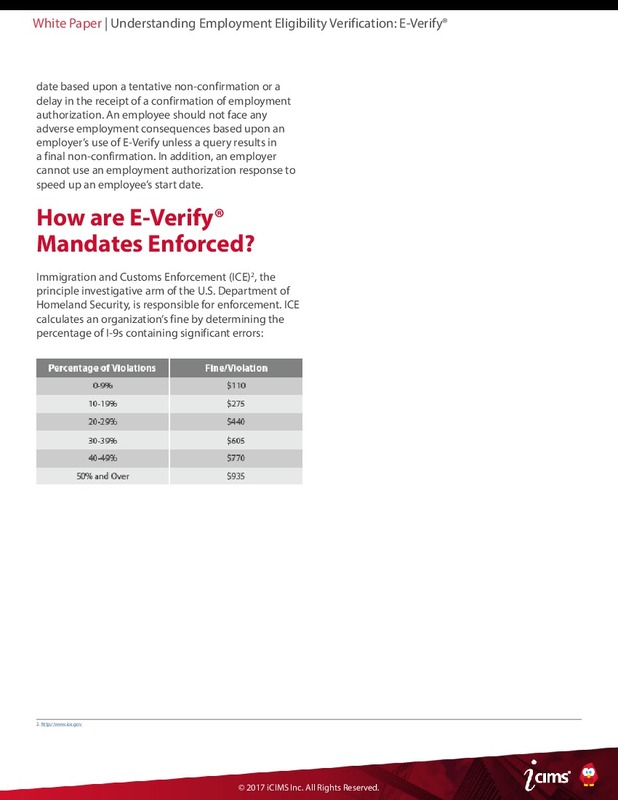 How are E-Verify® Mandates Enforced? In 2012, the U.S. Immigration and Customs Enforcement (ICE) issued 3,004 audits to businesses nationwide as an initiative to enforce employment and immigration compliance. Of those audits, 238 employers were arrested and there were $13,000,000 in Final Order Fines. With the recent influx of Notices of Inspections (NOIs), companies across the nation may be left wondering… “Who’s Next?” From I-9 basic requirements to storage & NOIs, this paper will offer best practices to prevent Form I-9 violations as well as tips on compliance. How long do I have to complete each section of a Form I-9? At the time of hire, all employees must complete Section 1 of form I-9 in its entirety. If the employee is not able to complete Section 1 without assistance or if he or she needs the form translated, a preparer or translator must read the form to the employee and have the employee sign the form in the appropriate place. In addition, the preparer or translator must also complete the Preparer/Translator Certification block on the form. How and where can I-9’s be stored? Employers must retain completed Forms I-9 for either 3 years after the date they hire an employee, or 1 year after the date employment is terminated (whichever is later). The forms can be stored 4 possible ways: Paper, Microfilm, Microfiche, or Electronically. Whichever method you choose, remember that the Forms I-9 must be readily accessible within 3 days of an inspection request. If your company chooses to retain the forms in paper format you may retain completed forms onsite or at an off-site storage facility. Forms I-9 may be retained on microfilm or microfiche. When choosing these forms of retention it is important to abide by a few best practices. Select film stock that is capable of preserving the image for the entire retention period, which could be upwards of 20 years. What are Some Ways to Prevent I-9 Violations? What Happens if I Receive a NOI? DHS, OSC, and DOL give employers 3 days’ notice prior to inspecting retained Forms I-9. The employer must make Forms I-9 available upon request at the location where DHS, OSC, or DOL requests to see them. Failing to properly maintain Forms I-9 can result in fines anywhere from $100 to $10,000 per violation as well as forfeiture of the company’s assets. iCIMS offers I-9 and E-Verify as part of its Employee Onboarding solution through an expanded partnership with Tracker Corporation8. 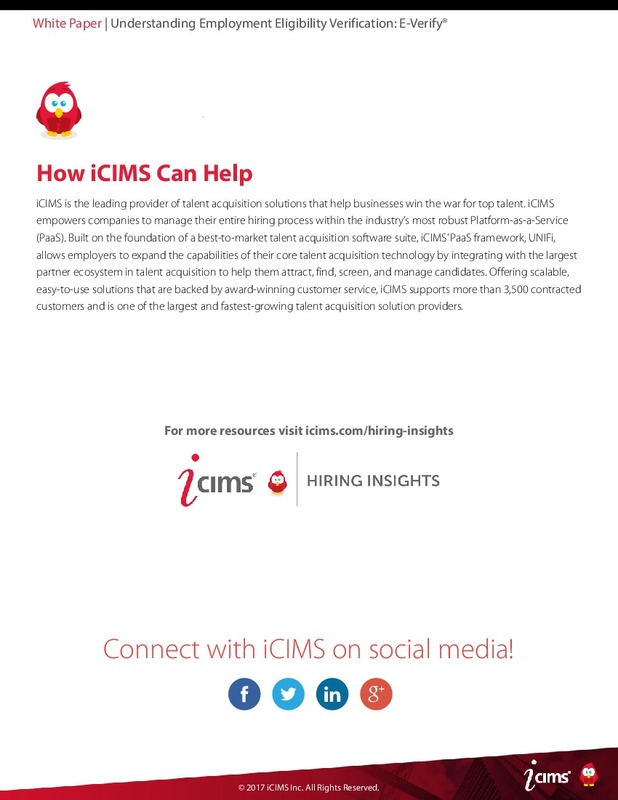 Customers leveraging iCIMS’ Onboarding Solution can benefit from a fully integrated system that provides automated and paperless preparation, signing, management, auditing, and storage of I-9 forms, as well as automatic E-Verify submission. The software guides new hires through form completion and virtually eliminates I-9 errors and audit risks through alerts and next-step notifications.